At Space Age Closets, we care about your health and hygiene. When working with our clients to create the best Toronto custom cabinets for bathrooms, we offer recommendations as outlined by the NIH. This health agency talks about items that you absolutely must not place in there. Or, if you need them where they’re easily accessible, we’ll show you how you can store them without their becoming a possible health hazard. Given that bathrooms have a lot of heat and moisture; it is advisable that you’re careful about the items you place here. Avoid storing items that can deteriorate quickly because of the humidity. These items include medicines and condoms. As your doctor will probably warn you, moisture can cause medicines and condoms to quickly go bad, especially over-the-counter medications. Do you feel that the bathroom is the most convenient place for your daily dosages? We’ll design your Toronto custom cabinets with airtight compartments or boxes that can take your supplies. We understand that you need your toothbrush next to the sink so you can grab it easily during busy mornings. However, hygiene experts warn of the possibility of bacteria growing on your toothbrush in the humid environs of your bathroom. And, if your toilet bowl is close to the sink, you have a problem on your hands. When we organize your Toronto custom cabinets for bathrooms, we might suggest an alternate placement of your supplies, like, in a closed drawer. Considering that cosmetics can go spoil and causes all kind of skin allergies, your skin care specialists will advise that you place all supplies in a cool and dry place. And, that’s definitely not the bathroom. You might want to keep the brushes you use for applying makeup and perfumes in the bedroom also. Yes, it is something of a bother. But, your skin will thank you for it. At Space Age Closets, we like to keep pace with the latest developments in the world of science. 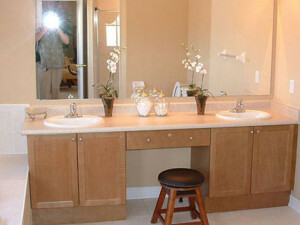 For this reason, we design our custom cabinets in Toronto with concern for your health and safety. Talk to our consultants. Today!